Our water filter and purification system uses two water filters and UV light purification. We first learned of this system design from Michael Pollock who had been installing these for 15 years in Cuba. Since installing them ourselves we have received input to help simplify the design and we have reduced the cost to under $1000. Water is filtered removing sediment and suspended impurities, then the water passe through a UV light chamber killing or sterilizing bacteria so it can not reproduce. Our food, water and even the air we breathe contain bacteria that can make us sick. When we consume large quantities of bacteria and it reproduces in our gut or if we have a weakened immune system, then the contaminates can make us very sick. The best system available will removing 99.99% of the contamination and prevent the remaining .01% from being able to reproduce. Optionally we provide a replacement UV bulb and extra filters to help maintain the system for 12 months after installation. 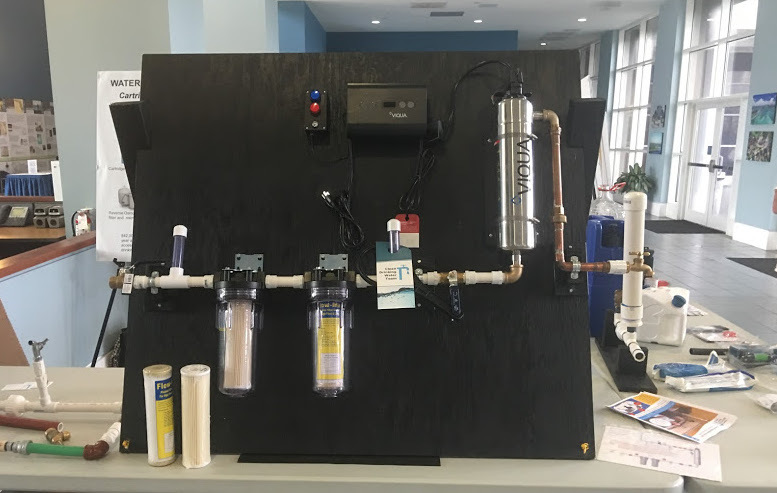 This system can be assembled for just about $1,000 including transportation, shipping and optional pipe and fittings to meet the needs for your location. Our goal is to keep refining this design and get the cost under $800. We often donate the tools we bring to the project sight to the community. We also provide water test kits so the community can monitor the system and to raise awareness about water sanitation. See our page on Water Quality to read more about our test kits.